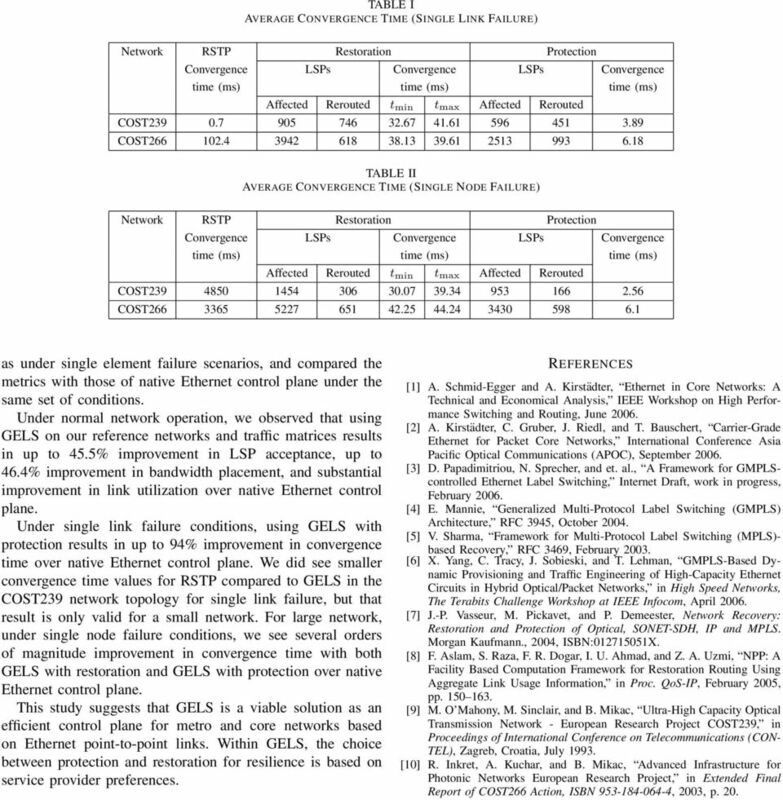 Download "A simulation study of GELS for Ethernet over WAN"
2 and methodology used for the performance evaluation of GELS. Section IV describes the simulation environment we used in our study whose results are reported in Section V. We finally conclude in Section VI. II. EVOLUTION OF GELS In the mid 199s, core networks saw a wide scale deployment of ATM switches owing to their high throughput compared to IP routers at that time. To enable the widely used IP standards to work with a high performing ATM core, an overlay model was envisioned for the service provider networks using these two different technologies. However, the control planes for IP and ATM are completely different and their cooperation posed a significant technical challenge. The proposals to address this problem evolved into Multiprotocol Label Switching (MPLS), designed to control devices with packet switch capable interfaces. Later on, MPLS was extended to GMPLS in order to control newer data planes such as optical cross connects and devices with fiber switch capable interfaces , . Thus, GMPLS provides a unified control plane for data planes that may be based on a variety of transport technologies. The IETF is presently considering a proposal to use the GMPLS control plane in Ethernet point-to-point links within the metro and core networks. 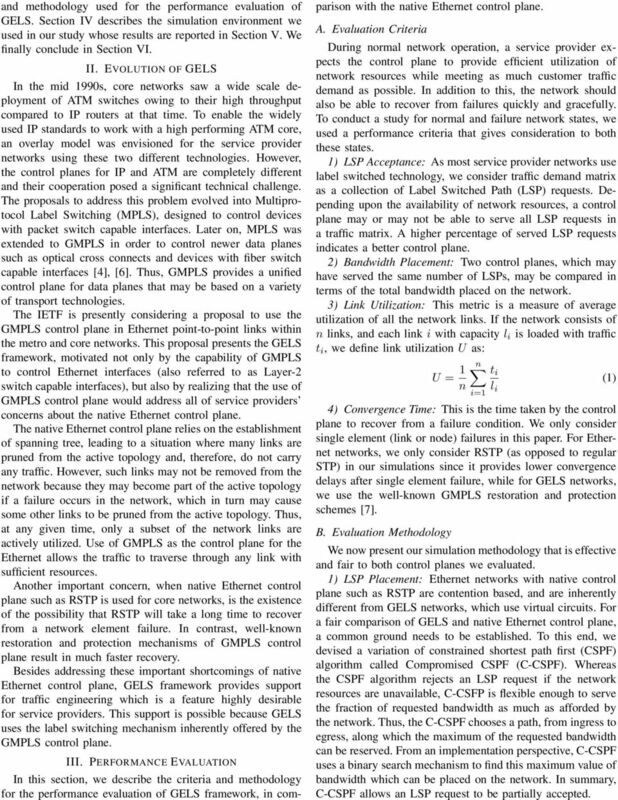 This proposal presents the GELS framework, motivated not only by the capability of GMPLS to control Ethernet interfaces (also referred to as Layer-2 switch capable interfaces), but also by realizing that the use of GMPLS control plane would address all of service providers concerns about the native Ethernet control plane. The native Ethernet control plane relies on the establishment of spanning tree, leading to a situation where many links are pruned from the active topology and, therefore, do not carry any traffic. However, such links may not be removed from the network because they may become part of the active topology if a failure occurs in the network, which in turn may cause some other links to be pruned from the active topology. Thus, at any given time, only a subset of the network links are actively utilized. Use of GMPLS as the control plane for the Ethernet allows the traffic to traverse through any link with sufficient resources. Another important concern, when native Ethernet control plane such as RSTP is used for core networks, is the existence of the possibility that RSTP will take a long time to recover from a network element failure. In contrast, well-known restoration and protection mechanisms of GMPLS control plane result in much faster recovery. Besides addressing these important shortcomings of native Ethernet control plane, GELS framework provides support for traffic engineering which is a feature highly desirable for service providers. This support is possible because GELS uses the label switching mechanism inherently offered by the GMPLS control plane. III. PERFORMANCE EVALUATION In this section, we describe the criteria and methodology for the performance evaluation of GELS framework, in comparison with the native Ethernet control plane. A. Evaluation Criteria During normal network operation, a service provider expects the control plane to provide efficient utilization of network resources while meeting as much customer traffic demand as possible. In addition to this, the network should also be able to recover from failures quickly and gracefully. To conduct a study for normal and failure network states, we used a performance criteria that gives consideration to both these states. 1) LSP Acceptance: As most service provider networks use label switched technology, we consider traffic demand matrix as a collection of Label Switched Path (LSP) requests. Depending upon the availability of network resources, a control plane may or may not be able to serve all LSP requests in a traffic matrix. A higher percentage of served LSP requests indicates a better control plane. 2) Bandwidth Placement: Two control planes, which may have served the same number of LSPs, may be compared in terms of the total bandwidth placed on the network. 3) Link Utilization: This metric is a measure of average utilization of all the network links. If the network consists of n links, and each link i with capacity l i is loaded with traffic t i, we define link utilization U as: U = 1 n t i (1) n l i=1 i 4) Convergence Time: This is the time taken by the control plane to recover from a failure condition. We only consider single element (link or node) failures in this paper. For Ethernet networks, we only consider RSTP (as opposed to regular STP) in our simulations since it provides lower convergence delays after single element failure, while for GELS networks, we use the well-known GMPLS restoration and protection schemes . B. Evaluation Methodology We now present our simulation methodology that is effective and fair to both control planes we evaluated. 1) LSP Placement: Ethernet networks with native control plane such as RSTP are contention based, and are inherently different from GELS networks, which use virtual circuits. For a fair comparison of GELS and native Ethernet control plane, a common ground needs to be established. To this end, we devised a variation of constrained shortest path first (CSPF) algorithm called Compromised CSPF (C-CSPF). Whereas the CSPF algorithm rejects an LSP request if the network resources are unavailable, C-CSFP is flexible enough to serve the fraction of requested bandwidth as much as afforded by the network. Thus, the C-CSPF chooses a path, from ingress to egress, along which the maximum of the requested bandwidth can be reserved. From an implementation perspective, C-CSPF uses a binary search mechanism to find this maximum value of bandwidth which can be placed on the network. In summary, C-CSPF allows an LSP request to be partially accepted. 6 TABLE I AVERAGE CONVERGENCE TIME (SINGLE LINK FAILURE) Network RSTP Restoration Protection Convergence LSPs Convergence LSPs Convergence time (ms) time (ms) time (ms) Affected Rerouted t min t max Affected Rerouted COST COST TABLE II AVERAGE CONVERGENCE TIME (SINGLE NODE FAILURE) Network RSTP Restoration Protection Convergence LSPs Convergence LSPs Convergence time (ms) time (ms) time (ms) Affected Rerouted t min t max Affected Rerouted COST COST as under single element failure scenarios, and compared the metrics with those of native Ethernet control plane under the same set of conditions. 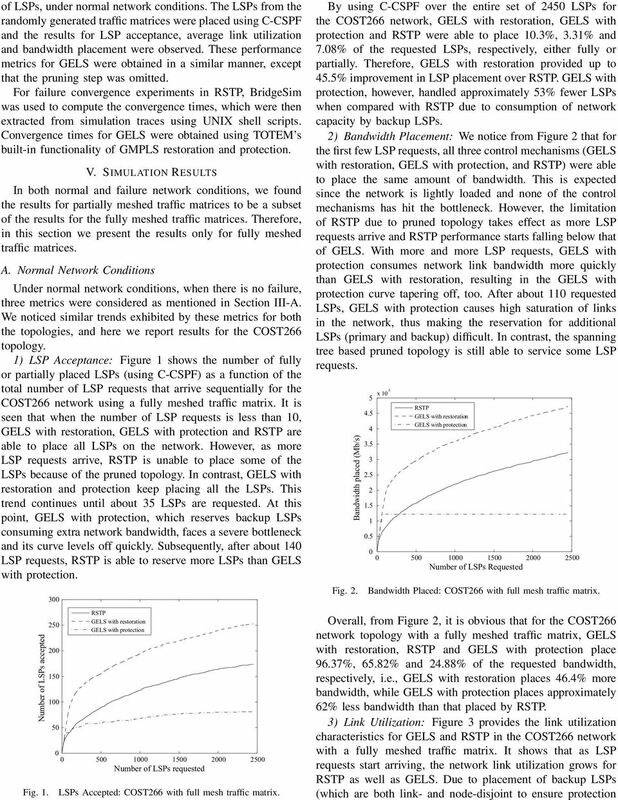 Under normal network operation, we observed that using GELS on our reference networks and traffic matrices results in up to 45.5% improvement in LSP acceptance, up to 46.4% improvement in bandwidth placement, and substantial improvement in link utilization over native Ethernet control plane. Under single link failure conditions, using GELS with protection results in up to 94% improvement in convergence time over native Ethernet control plane. 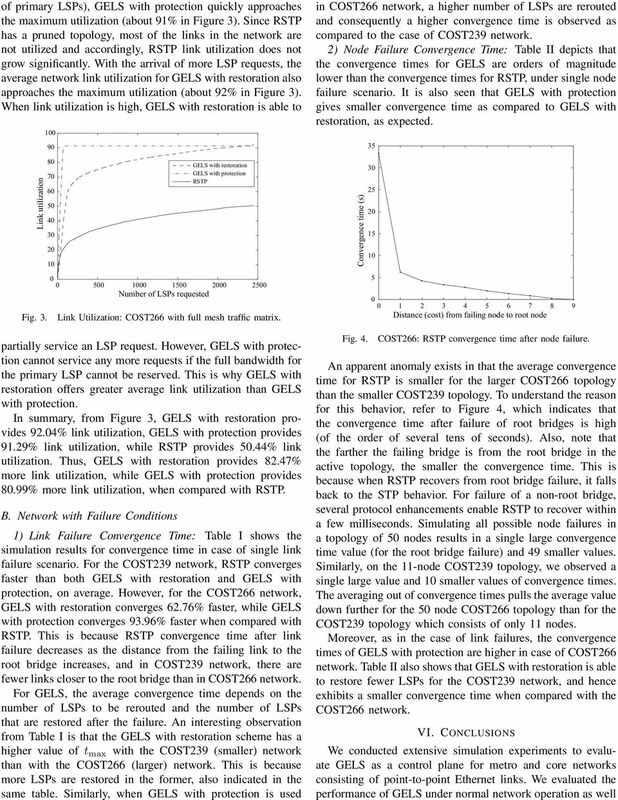 We did see smaller convergence time values for RSTP compared to GELS in the COST239 network topology for single link failure, but that result is only valid for a small network. For large network, under single node failure conditions, we see several orders of magnitude improvement in convergence time with both GELS with restoration and GELS with protection over native Ethernet control plane. 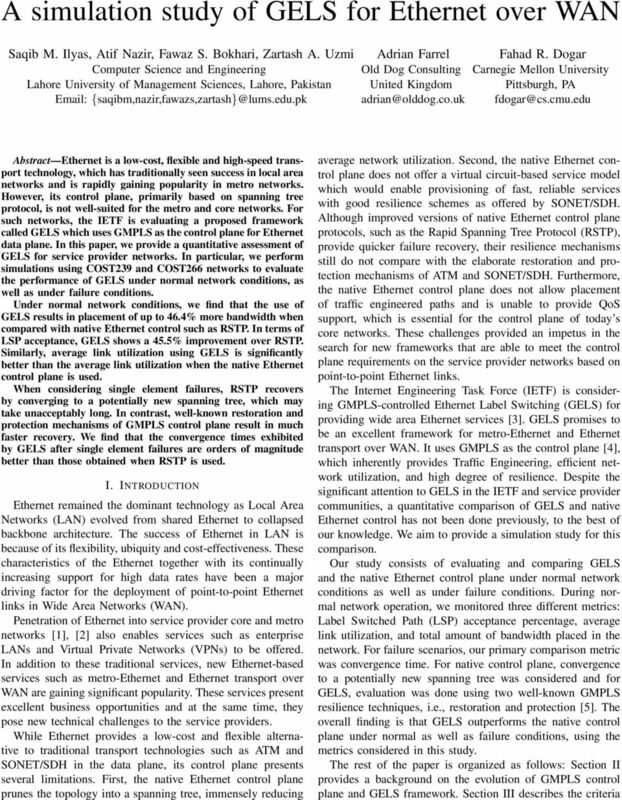 This study suggests that GELS is a viable solution as an efficient control plane for metro and core networks based on Ethernet point-to-point links. Within GELS, the choice between protection and restoration for resilience is based on service provider preferences. REFERENCES  A. Schmid-Egger and A. Kirstädter, Ethernet in Core Networks: A Technical and Economical Analysis, IEEE Workshop on High Performance Switching and Routing, June 26. A. Kirstädter, C. Gruber, J. Riedl, and T. Bauschert, Carrier-Grade Ethernet for Packet Core Networks, International Conference Asia Pacific Optical Communications (APOC), September 26. D. Papadimitriou, N. Sprecher, and et. al., A Framework for GMPLScontrolled Ethernet Label Switching, Internet Draft, work in progress, February 26. E. Mannie, Generalized Multi-Protocol Label Switching (GMPLS) Architecture, RFC 3945, October 24. 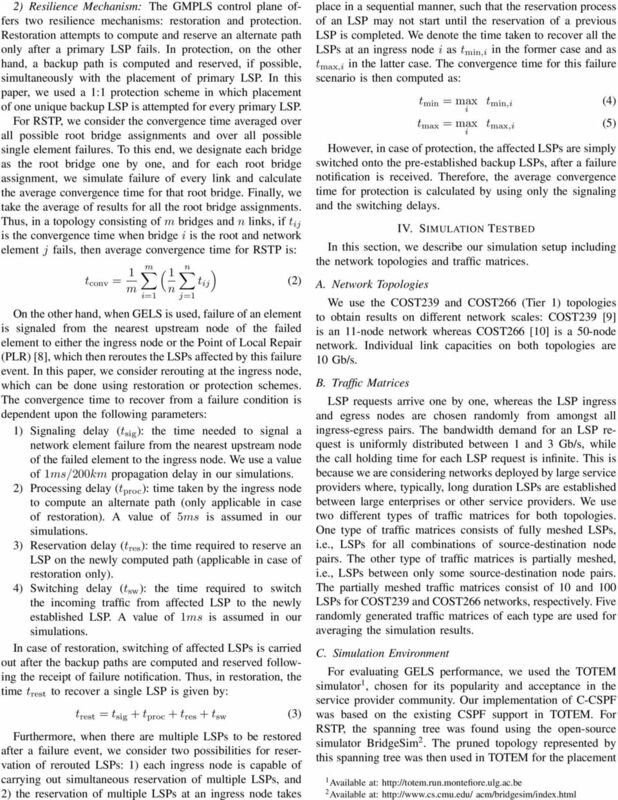 V. Sharma, Framework for Multi-Protocol Label Switching (MPLS)- based Recovery, RFC 3469, February 23. X. Yang, C. Tracy, J. Sobieski, and T. Lehman, GMPLS-Based Dynamic Provisioning and Traffic Engineering of High-Capacity Ethernet Circuits in Hybrid Optical/Packet Networks, in High Speed Networks, The Terabits Challenge Workshop at IEEE Infocom, April 26. J.-P. Vasseur, M. Pickavet, and P. Demeester, Network Recovery: Restoration and Protection of Optical, SONET-SDH, IP and MPLS. Morgan Kaufmann., 24, ISBN: X.  F. Aslam, S. Raza, F. R. Dogar, I. U. Ahmad, and Z. A. Uzmi, NPP: A Facility Based Computation Framework for Restoration Routing Using Aggregate Link Usage Information, in Proc. QoS-IP, February 25, pp  M. O Mahony, M. Sinclair, and B. Mikac, Ultra-High Capacity Optical Transmission Network - European Research Project COST239, in Proceedings of International Conference on Telecommunications (CON- TEL), Zagreb, Croatia, July  R. Inkret, A. Kuchar, and B. Mikac, Advanced Infrastructure for Photonic Networks European Research Project, in Extended Final Report of COST266 Action, ISBN , 23, p. 2. Understanding PBB-TE for Carrier Ethernet Introduction Ethernet is evolving from an enterprise LAN technology to a much more robust, carrier-grade transport technology for metropolitan service networks.